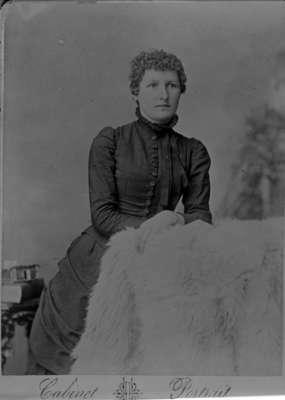 A black and white portrait photograph of Emma Warren (1844-1928). Emma Warren was the twelfth (12th) of sixteen (16) children of William Warren and Clarissa Lynde. She was born at Whitby Township on March 31, 1844 and died on December 13, 1928 at Toronto. She is buried at St. John's Anglican Cemetery, Port Whitby. Emma Warren, 1884, R. Bell. Whitby Archives 31-009-249.